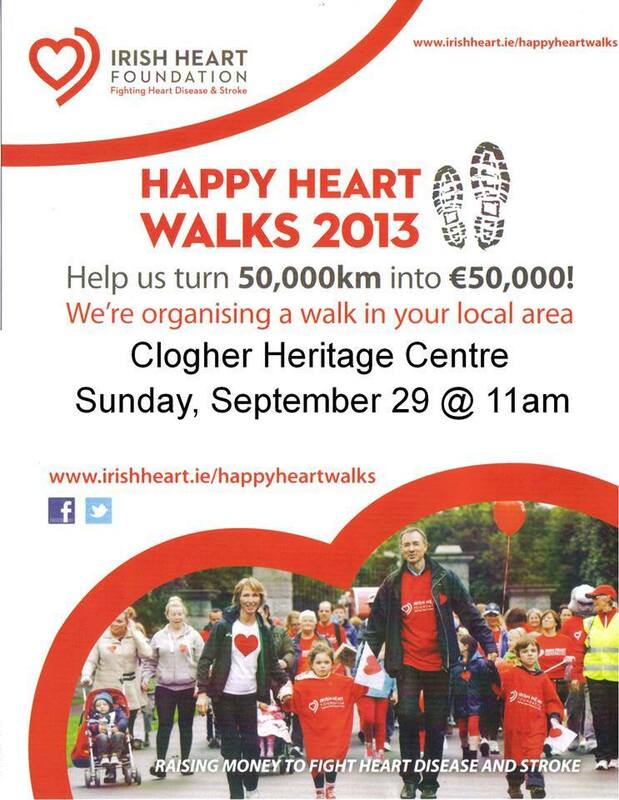 HAPPY HEART WALK NEXT SUNDAY AT 11 A.M.
MEET AT CLOGHER HERITAGE CENTRE. All monies raised will go to the Irish Heart Foundation. Please help to stamp out heart disease. The Irish Heart Foundation is marking World Heart Day this year by encouraging, communities, families and friends to organise a ‘Happy Heart Walk' on Sunday 29th September 2013 in a national bid to walk 50,000km. This event marks an opportunity to promote the importance of walking for heart health within your community by helping to hold a ‘Happy Heart Walk ‘. Join us for the biggest walking day of the year on Sunday 29th of September to mark ‘World Heart Day' and use your feet to help us get one step closer to transforming 50,000km into €50,000. All you have to do is enjoy join in a 5km walk by yourself, with friends or with a group and raise €1 for every kilometre walked. Remember every 5km counts - and every €5 raised will help us keep more hearts beating by supporting vital research, health promotion and resuscitation programmes to prevent more deaths from Ireland's No.1 killer.